In an earlier post I provided a list of tips on how to stay slim this summer. Now that summer is upon us, and the wine & appies are flowing it’s a different ballgame. We were talking this weekend about appetizers, and it’s sort of a funny tradition. On a Monday night do you eat crackers, cheese, pate and chips & dip before dinner? No. So why do we do it on the weekends? Weekends are usually a time for getting together with friends, having dinner parties or celebrating birthdays, and food is a big part of that. Guacamole is one of my favorite appetizers. While avocados are really good for you, they are still high in fat & calories. Half of a large avocado is about 160 calories. This weekend I figured out a way to make a slimmed down version of guacamole. Instead of using 3 avocados I just used 1, and substituted the other 2 with a large zucchini. I know you guac lovers out there are skeptical, but trust me – it tasted exactly the same. You can also include salsa to add lots of flavor without the calories. Zucchini or ‘summer squash’ are in season right now, so give it a try this weekend! And before your next dinner party coordinate the appetizers with your friends to ensure that there’s only a couple choices, and challenge each other to try new, healthy appetizer recipes instead of just bringing the standard cheese tray or chips & dip. Chop zucchini into small cubes (you can keep the peel on). Place zucchini in a microwave-safe bowl, and cover with a damp paper towel. Microwave on high for 4-5 minutes, and set aside to cool (I didn’t have much time so I put mine in the freezer for 5 minutes). 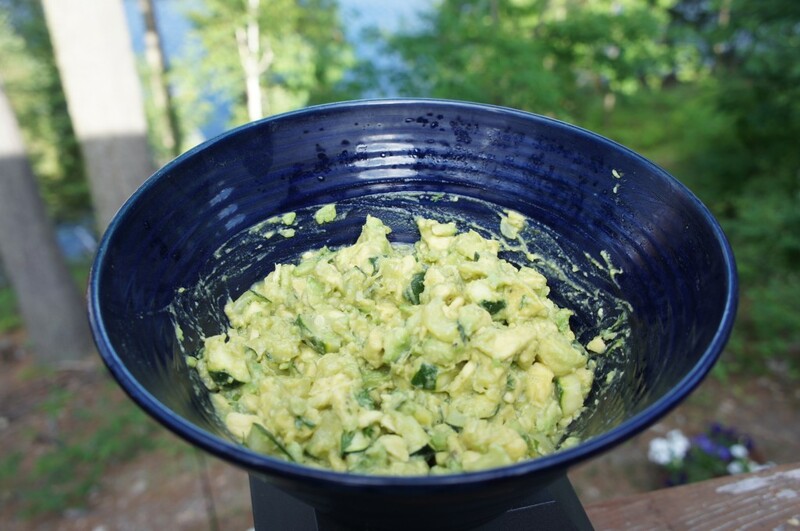 Chop cilantro, avocado & garlic, and place in a serving bowl. When zucchini is cool, combine with avocado mixture, and add the salsa, cumin, lime juice, hot sauce, and salt & pepper. Stir everything together until just combined (should be kind of chunky). Serve with organic tortilla chips, and cucumber slices (sprinkle with salt & pepper for a low-cal chip substitute) – Enjoy! (You can make also ahead, and store in the fridge until ready to serve – the lime juice keeps the avocado from turning brown). Great idea Laur. I as well love guacamole but try not to have it too often. I love the idea of substituting avocado for zucchini, I will definitely try your recipe this week. Thanks Linda! And thanks for the comment! Its nice to know I have some readers out there 😉 The girls met up for book club in April while I was away, and we’re going to start up again in September. Are you planning on visiting TO anytime soon? Maybe we can all meet up for a book club when you’re back?! Enjoy the guac!